This Dec. 7, 2018, file photo, Rep. Jerrold Nadler, D-NY, ranking member of the House Judiciary Committee, speaks to members of the media as he arrives at the Rayburn House Office Building where former FBI Director James Comey was testifying to the House Judiciary and Oversight and Government Reform committees on Capitol Hill. 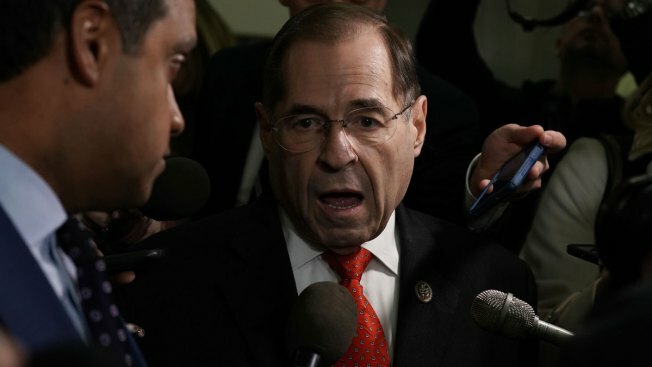 The most powerful tool available to Democrats taking control of the House next month, the subpoena, is being held in reserve as they build their strategy to investigate the Trump administration, congressional officials in the party involved in decision-making told NBC News. Subpoena power is hardly a magic wand, according to top lawmakers, aides and former officials, and key committees are said to be planning a more deliberate approach starting with targeted requests for information from Trump officials. "You have to pick your targets. You have to prioritize and focus on the ones you really need, and where you can win public approval," said Irvin Nathan, House Democrats' top lawyer last time they controlled the chamber. While progressive activists are eager for a showdown with President Donald Trump, some Democrats are looking for places they can cooperate with him on legislation.